For some reason, the can design for this autumnal release from Wayward brought back an unlikely memory. The combination of white SUV making its way through the Red Centre, the thoughts of dry dustiness and the title's reference to a deceased native animal reminded me of the day when, cruising the Outback on a quad bike alongside the farmers who were then my employers, I was first informed just how well suited a roo's scrotum was for use as a purse or wallet. (Admittedly, the large example next to whose carcass this conversation took place was a couple of days too dead for his to be of any value). It's the sort of minutiae that, while being of almost no significance to one's continued existence on the planet – less useful, say, than the revelation at age 39 that there's a little arrow on fuel gauges in cars that tells you on which side you'll find your fuel cap – never leaves you. And, thus, 19 years later, begs the question of this beer: "Is it a load of old balls?" Well, no. 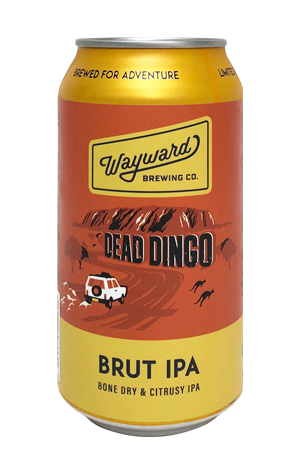 Wayward know their way around a beer and here deliver Dead Dingo's hop flavours and bitterness in a tightly wound manner; the label might say juicy but it's a Brut so a long way from the brewery's hazier offerings on that front, with the fruit joined by some herbaceous touches too. As is typical of such deliberately lean and dry beers, it doesn't leave too much behind for long either, like a dingo's carcass (or roo's purse) after the feathered scavengers have been to work.